Crafted of high-quality, heavy resin, this sitting Buddha features a beautiful two-tone finish with intricate detailing. This statue of Buddha, Hotei, features the lucky pearl in one hand, and the lucky ingot of gold in the other. Hotei is now joining my Japanse maple tree to start a zen garden in my yard. He is better than I thought because his outfit has some sparkles in it. It has great color details, and it looks great in the yard! My happy guy greets me when I get coffee in morning....another great remembrance from this years China trip! 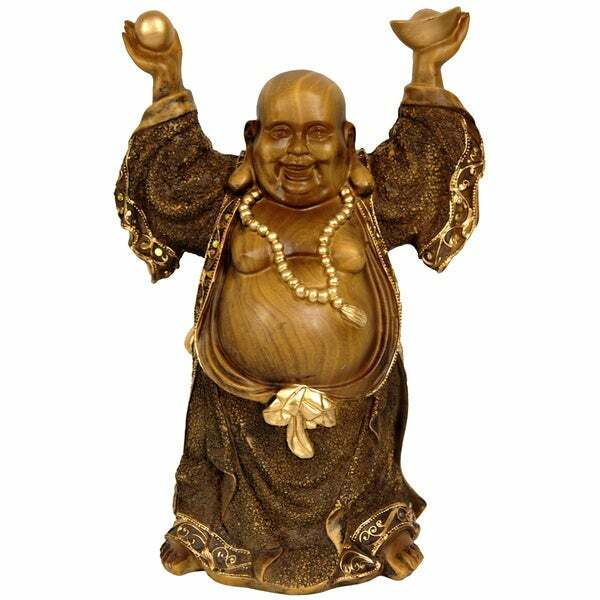 Got this as a birthday gift for a friend who's always wanted a Hotei for good luck - she loved it! This is a well made an inspirational statue. Great price for the quality. I love this Buddha decor! Every time I walk past him a smile comes across my face. The only reason that I could not give 5 stars for this product is because there were some scratches and minor discolorations on the arms of this product upon arrival. I still would recommend this product though. I loved this buddha! However, when I got it in the Mail he was broken. I was sad to have to send him back. I would still recommend this to someone interested in it. Would have given 5 stars had he not come broken.